Guests evacuated from Leopard Beach Resort in Diani after fire broke out – Kenyatta University TV (KUTV). All Rights Reserved. 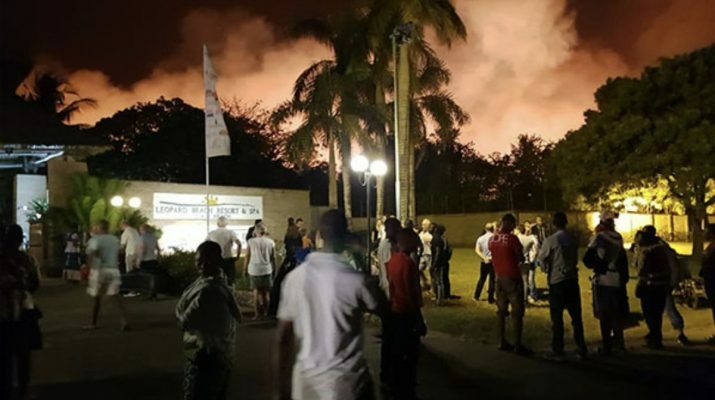 At least 200 guests were evacuated when fire broke out at Leopard Beach Resort in Diani .The fire spread to two cottages, destroying property valued at millions of shillings. Devolution Cabinet Secretary Eugene Wamalwa was among the guests at the resort. Kwale County Police chief Tom Odero said the guests were taken to nearby hotels. He added that the blaze started around 10pm. Authorities suspect the inferno was started by sparks from fireworks during a wedding, he said. “While we admit there were fireworks, investigations into the incident have been launched,” Mr Odero said, adding that police officers were collecting samples from the scene. “It is a tragic incident but there were no injuries,” the police boss said, adding that the fire spread fast due to strong winds. The neighbouring Warandale and The Governor cottages were destroyed by the blaze. The Governor cottages caretaker Karisa Katana Ngala said three houses and a store were destroyed. “We heard an explosion at the hotel followed by a fire that quickly spread to our premises,” he said, adding that he could not estimate the losses. Mr Ngala said workers and the management are waiting for communication from the owner of the cottage, probably today. Jane Mukundi,a Collibus Conservation Manager said wild animals within the fire vicinity died . In 2018, Leopard Beach was feted as Africa’s leading family resort for the second year running. It was also named Africa’s leading resort and the continent’s top spa resort for the third year in a row. Leopard Beach general manager Kioko Musyoki said the fire affected 120 rooms. All the guests were safely relocated, he said.